The Financial Aid Podcast’s Christopher Penn has released a free .php script, the Podcaster iPhone Kit, that can be used to generate an iPhone-friendly page for your podcast. This simple little web page parses your podcast’s XML feed and slaps it into a nice page designed to render well in Safari, which is the browser on which the iPhone operates. It also grabs your feed’s image and displays it as the icons. 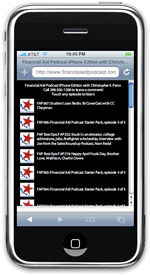 Here’s an example, an iPhone-friendly page for the Financial Aid Podcast. Download the Podcast iPhone Kit. Edit the config.php file with a text editor like Notepad, BB Edit, etc. and set all values as appropriate. Copy the entire folder to your podcast’s web site. You may need to set the folder’s permissions to writeable, depending on your web host. Link to your iPhone-ready site from your podcast’s home page. The Podcaster iPhone Kit is licensed under the Creative Commons 3.0 US By Attribution, Non-Commercial, Sharealike license. Great tips, this deserves to be bookmarked! User experience, people forget this. Thanks for the love, guys! Kevin – I would suggest keeping the phone number at the top of the script because it’s tappable on the iPhone – your comment line is just a finger’s tap away from any iPhone user. In my version the phone number is still “above the fold” on the iPhone screen and clickable too. I didn’t think I needed two clickable phone numbers in my version and wanted to make the entire contents fit onto one iPhone screen.